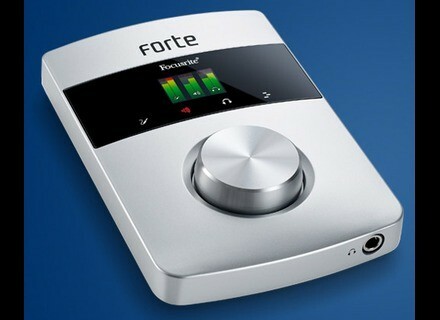 Forte, USB audio interface from Focusrite. One year ago, Apogee introduced the Duet 2, a digital audio interface with remarkable sound and finish, but only available for Mac computers. 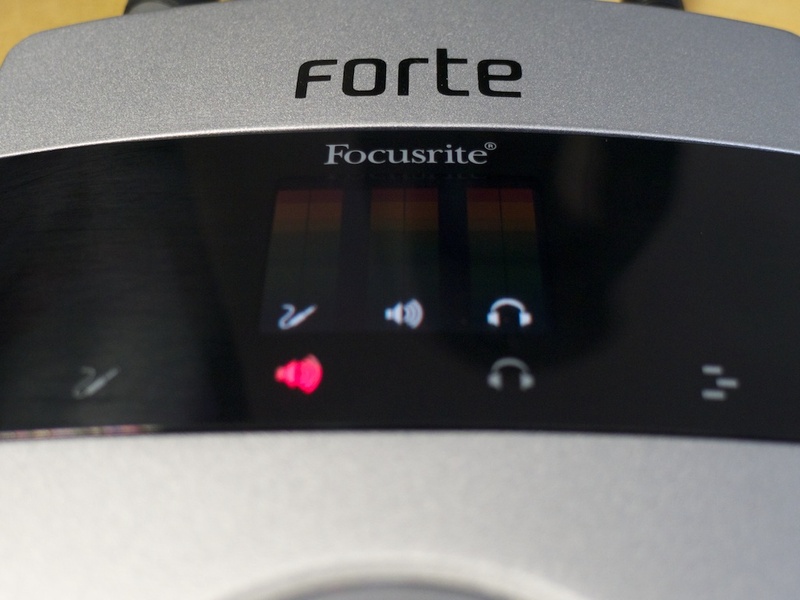 Focusrite realized that it was an opportunity and presented the Forte, a direct competitor with comparable dimensions — plus Mac and PC support! But can it really compete in terms of quality? The history of high-grade, mobile digital audio interfaces started back in 2007 when Apogee introduced the Duet, an audio interface with 2 ins/outs, a FireWire port, a big encoder and a classy finish, but only Mac compatible. A new style of audio interfaces was born, and it fulfilled the needs and wishes of demanding musicians who needed high-quality audio in a compact and easily transportable unit. In 2009, we reviewed RME's answer to the Duet: Babyface, an interface with Mac/PC support, a USB port and ADAT input/output that inspired many other products. Apogee struck back one year later with the Duet 2, a USB interface with a nice OLED display but, once again, not for PC. Several months ago, we also reviewed the Track16, MOTU's reaction to these new mobile interfaces with its impressing 16 ins and 14 outs! 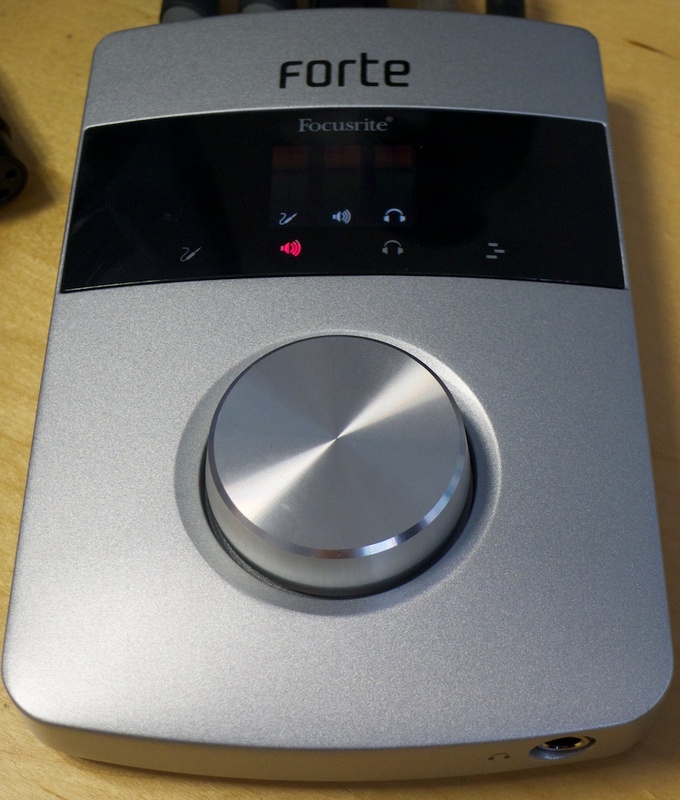 Since I personally reviewed both the BabyFace and Duet 2, I was very excited when I received the package from Focusrite (a brand created by Rupert Neve himself). Although the two interfaces I previously reviewed definitely satisfied me, they are not perfect. On the one hand, the manufacturing quality of RME's product is not as good as the software and audio performance; on the other hand, Apogee's solution has no Windows support (the brand is bound to Apple) and no digital ins/outs. As for the Track16 and its numerous ins/outs, it is a bit bulkier than its competitors, especially because of the cable snake. And what about the Forte? Anyone who has unpacked an Apple product will immediately recognize Focusrite's source of inspiration: the classy white box presents the product in a simple way but makes you feel like unpacking it right away. Inside the box, the arrangement of the components is not as well thought out as with Mac products, but it doesn't matter that much... We were dazzled by the look and manufacturing quality of the Forte. It is at the same level as the Duet 2 and maybe even a bit higher. 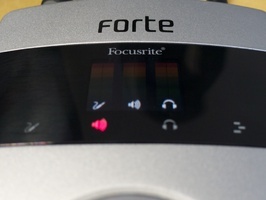 In any case, the Forte is far ahead from the Babyface with its old-school LEDs and fragile encoder. The Forte makes a great couple with our iMac, and it's probably no coincidence considering the typical target user... Dimensions (115 x 345 x 171 mm) and weight (487 g) of the unit are comparable to those of the Duet 2 and BabyFace. Don't worry it won't fall off from your desktop! It is almost identical in design to the Duet 2: a big push-encoder (but without steps), a nice OLED color display, four buttons (the Duet has only two), a headphones output, a USB 2 port, and a cable snake with the four 1/4" jack (instrument) and XLR connectors. However, there is a difference: the main outs are directly on the housing, not on the cable snake, which is a cleaver idea because you don't need the cable snake to mix a session if you are not recording anything. The Duet 2 and Babyface only allow you to mix with a pair of headphones without the cable snake. The cable snake includes two XLR inputs for microphones and two TRS 1/4" jacks for line and instrument level signals. The XLR connectors are a bit less bulky than on the Track16 and Duet 2 — another good point. Note that the Forte can be used without external PSU adapter, in which case it is powered via the USB 2 bus (don't go asking for USB 3, it's not even worth it to talk about it in the forums — would you ask for USB 2 for a mouse? ), which provides no 48V phantom power and reduces the level of the headphones output. The four buttons allow you to adjust either the input levels, the output levels, the headphones level, or the DAW return via the rotary encoder. The hardware is very user friendly, but how does it look like on the software side? For each input, you get a nominal level selector (line, instrument or mic), a 48V phantom power switch, a -10dB Pad switch, a phase reverse switch, and a low-cut filter (75 Hz, 12 dB/oct.). 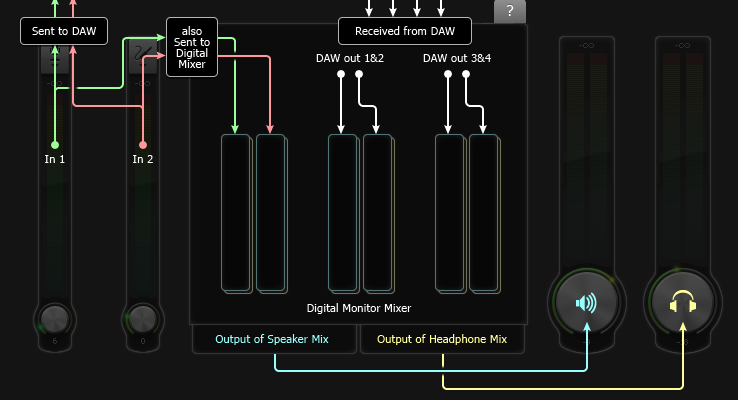 You can also link both inputs for stereo sound sources. For the the two stereo outputs (main and headphones) you get a virtual volume control, a dim (12dB) switch, a mute switch and a mono mode. 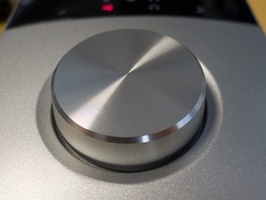 In the middle of the screen, you'll find the mixing section with the two inputs and the two stereo DAW returns, each with mute and solo knobs, plus pan control. Two tabs are available, one for the main out feeding the studio monitors, the other for the headphones out. This way, you can make two different mixes by assigning the DAW returns 1/2 to the monitor speakers and 3/4 to the headphones. You can also assign the microphone return only to the headphones in order to avoid feedbacks. Everything is extremely simple and the learning curve is very short. Our first remark here is that it's a pity that the rotary push encoder cannot be assigned directly to a function like dim or mute. When you're on the main out page, the encoder adjusts the volume, but to access the other settings, you have to hold the button above the encoder. Afterwards, you can scroll the cursor by turning the encoder to choose between mute, dim or mono, then push to select the function: a long and annoying procedure! We would like the possibility to mute or dim the volume just by pushing the encoder on the main page. All the more considering that, on the DAW page, the encoder allows you to send control data depending on the software you're using (see small logo). This way you can control, for example, the Play/Stop or zoom functions, which is very convenient. Luckily, such improvements can be easily implemented in a future update. So we hope! Otherwise, we have nothing negative to say: the display is very pleasant and all four buttons react very well. 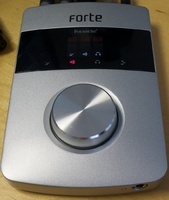 After playing with it for a while, it became clear to us that the Forte is more a direct competitor of the Duet 2 and not so of the Babyface or the Track16. Indeed, even if all three interfaces are in the same price range and belong to the mobile interface category, the philosophy of the Duet 2 is a bit different, just like the Forte. The goal is to offer an audio interface with terrific design and manufacturing quality, equipped with a few ins/outs in order to make operation easier. The Babyface and Track16 both have more comprehensive features: MIDI and digital ins/outs, integrated effects, advanced virtual mixer, etc. But they are not as easy to learn. 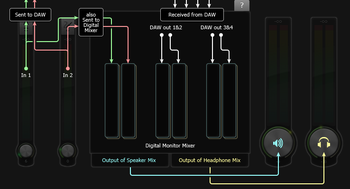 Some musicians prefer to have only the features they need and an easy-to-use interface. 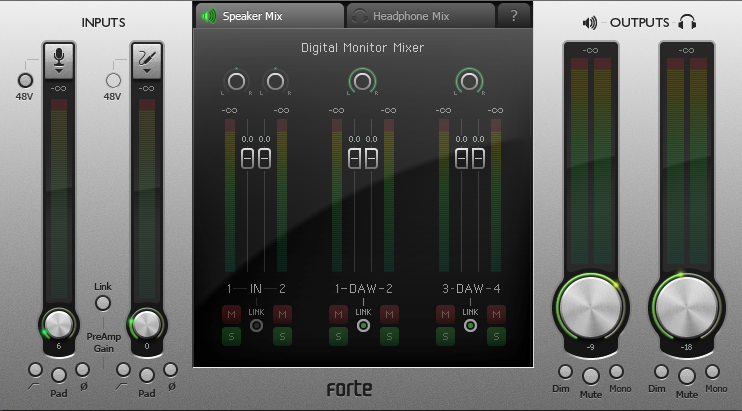 The Forte is so similar to the Duet 2 that it has the same limitations: no MIDI nor digital ins/outs, no effects (EQ, reverb)... But it has a decisive advantage: it can be used both with Mac and PC, unlike the Duet 2 that likes only apples. Home-studio owners working with a PC may have found the audio interface they were looking for. Afterwards, we measured the noise floor of the preamps using an XLR cable with bridged hot and cold wires. 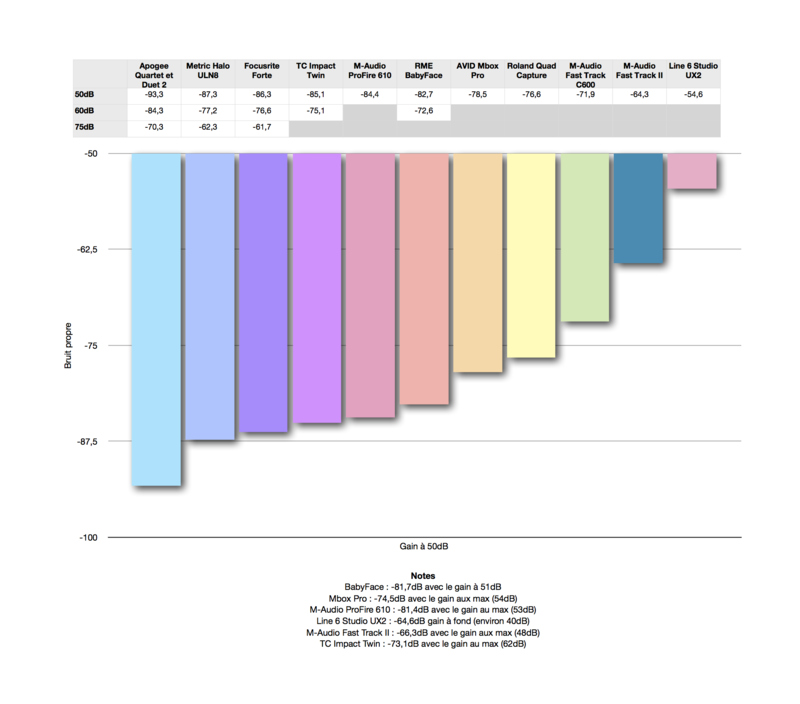 Besides an extended gain range (75dB, like the Duet 2, but more than the 60dB gain range of the BabyFace and Track16), they are particularly quiet: at 50dB gain, the level meter shows -86.3dB, which is almost as good as our Metric Halo ULN8 (-87.3dB) and the Duet 2 (-93.3dB) and better than the BabyFace (-82.7dB) or the Mbox Pro (-78.5dB). Focusrite became famous for their preamps and this preamp module confirms their know-how. Do remember that these are only figures. They depend on many factors and some differences are not obviously audible. 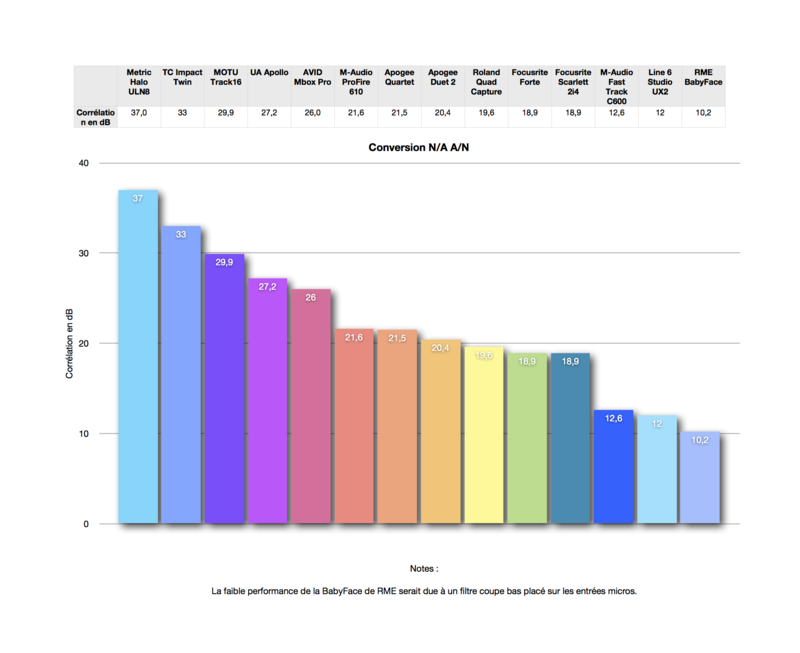 Today's audio interfaces offer a quality that is enough for most home-studio applications, and we recommend you not to base your choice only on benchmarks. Finally, we tried out the driver stability with a Studio One 2 64-bit project including many audio tracks and Ozone 5 plug-in instances. We started with a 512 sample buffer size and checked the maximum number of tracks without "crackles" or drop-outs. 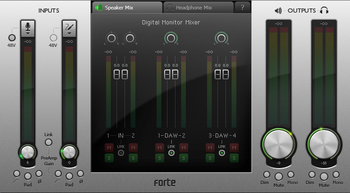 Once again, the Forte performs above average: it beats Motu's Track16 and RME's Babyface, but doesn't reach the level of the Metric Halo ULN8 or the Mbox Pro. 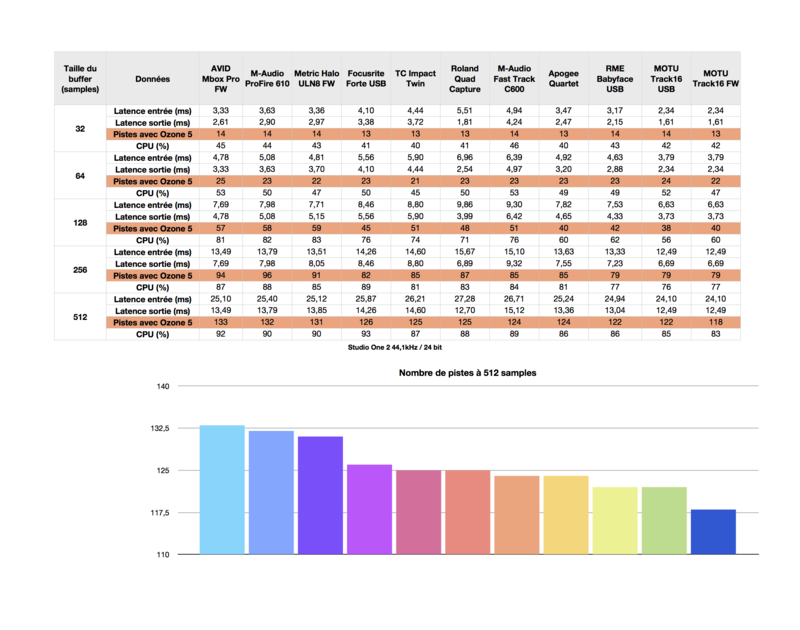 All benchmark results are available as tables and graphs and they will be updated every time we review new digital audio interfaces. 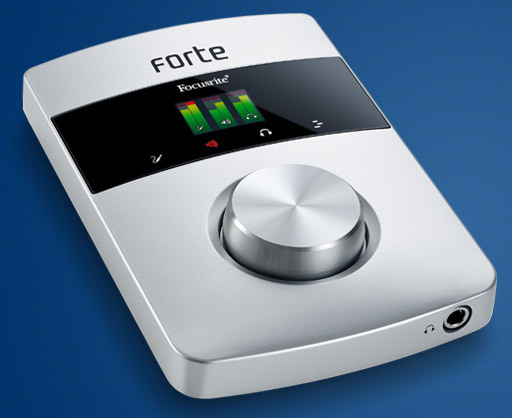 Focusrite's goal is clear: they want to compete directly with the Duet 2 while adding PC support. Finally, an interface with sleek design and perfect manufacturing quality. The resemblance with Apogee's interface is pretty obvious, from the OLED display to the ease of use and the big aluminum rotary encoder. The quality of the preamps will satisfy demanding home-studio owners who need no digital ins/outs nor processing and who work under Windows occasionally or solely.